Anonymous Sai Devotee from USA says: Dear Baba, I have been thinking to write this love letter to You since a long time now. But not sure what was pulling me back. I feel that I get pulled by Maya every time but You are always there to pull me into Your direction and I guess that's how I am able to survive so far. Don't know where to start talking about Your leelas or Your miracles. There's no agenda for me to write anything here today but the words might flow as I pen down my experiences or thoughts. How can I become free from ego, pain and selfishness? Can You please walk with me, talk with me, Eat with me, Sleep by my side and be every second with me. You have shown me Your presence many times but, I again get pulled into the selfish world which is really disturbing. I did find some of my answers through Hetalji's blog. Thanks a ton to her. I wouldn't have continued to be positive today without this blog and Jaya Wahi's book. Let me share one of my experiences which I guess Baba wants me to share with my Sai devotees today. It was during that time where I was doing my schooling and I always had this irregular period’s problem, hormonal imbalance and PCOS and what not. People used to tease me, make fun of me looking at the abnormal hair growth on my face. Teenage was something you would want to be liked by someone or you might have crushes or attractions. But I was in a situation where I didn’t know even if I would be liked by anyone ever. I thought this is how my whole life would continue. I hated myself. I wanted to end my life since I was very weak at heart then. But then one day I expressed my feelings with my mom since she's my very best friend. So, she took me to laser treatments, I visited many doctors, I was given lot of medication etc. Everywhere I went for a check-up I only got negative feedback from doctors saying it was not possible for your daughter to recover easily. She cannot get pregnant at all. Every doctor we used to visit, I was prescribed with different kinds of medication to overcome the hormonal imbalance problem or PCOS. It was very painful since the process was really slow and I was running out of patience. Then came Baba into my life through my mom. She asked me to leave all my worries to Baba and trust Him completely. I did not develop that trust immediately but it happened gradually. I was still suffering from my health issues in spite of my prayers. Nothing changed. But the only thing which changed was I got stronger. More humiliation, more negativity, more pain from people was countless. But one thing changed for sure "I got stronger", "more bold", "more positive". I used to walk away with a smiling face when people made fun of me. I questioned myself? How did this change happen in me and the answer was/is "Baba". Things started changing slowly. I was in my college, Engineering, Masters and I finally got married to my husband by Baba's grace. Now, I had a different fear. Will I be ever pregnant? I started visiting a doctor in US and got myself checked. She clearly said you hardly have any problem. Not to worry at all. I can give you very basic medication and you can get pregnant sooner. What? Did I hear that right? I have been hearing negative feedback all through my life and my ears were prepared to hear the same thing this time as well. And yes due to Baba's Grace I did get pregnant and now I have a beautiful daughter who's 5 years old. The moment I knew I was pregnant , I just felt like going back to India and shout loud and clear into people's ears who said that I can never pregnant in my life. How’s that things cannot be possible without my friend Baba. One clear lesson I learnt from this story is, Baba knows what pain you are going through, but He'll never leave His child suffer for a long time. If you think He's being silent and is not answering your prayers, then you are thinking wrong. He's actually working on your application high up there and fighting with the evil which is coming in your way. Every time you say to Baba "I don’t trust You anymore" or "Why aren’t You answering my prayers", He answers back to you in His sweet tone "Oh my child, please don’t leave your father alone, Please trust in me. Whatever is going to happen is for your own good. Me being your father cannot let you down. Get up and lets walk together". Such wonderful are Baba's words. This is how I talk to my Baba everyday. Give Him food, water, clothing, flowers. Don't always ask Him "Give Give"…offer whatever you can, but with love and not to expect anything from him. He knows when to do what? Allah Malik! Anonymous Sai Devotee from Australia says: Om Sairam. Baba, please always shower Your grace upon us. Thank You for all the blessings and lessons that You have showered and taught us. Forgive us for all the sins that we have done knowingly and unknowingly. Show us the right path and guide us every minute and holding our hands taking us to our destination. Without You we are lost in this world which is full of Maya. Oh, Sai You are omnipresent, omniscient and omnipotent. Love You Baba. Thanks Hetalji and team for this divine blog. May God bless you with good health and happiness in life. I am going to share my experience that recently happened to me. In the month of February 2017 we planned a holiday to Fiji. We were supposed to leave on Saturday. After finishing my work on Friday, picked my son from day care and came home. We finished most of the packing and was waiting for my husband to return from work. At around 6.30p.m I was feeling very restless. I couldn't breathe and my chest and left hand was hurting and I felt as if someone was squeezing it very tight. I immediately called my husband to check where he was. He said he was reaching house in 5 minutes. My heart started palpitating and I felt as if I am going to die. My husband reached home and I told him that I feel I am going to pass out soon. He calmed me down and gave some warm water and took me to the clinic nearby our home. The doctor checked everything and asked me to get ECG done. I was praying to Baba that it should not be anything related to heart. I was continuously chanting Baba’s name while getting my ECG done. The ECG reports were normal but doctor advised us not to travel to Fiji the next day and gave us a medical certificate that I am unfit for travelling next day. And he asked us to go to emergency straight away and be under observation and get some blood test done. We straight away went to emergency and I was crying all this while thinking what would happen to my 4 year old son if something goes wrong. I was asking Baba to protect me from any danger and help me. In emergency they took my blood samples and ECG again. ECG report was normal again and they asked us to wait for blood report. I was very worried and praying to Baba in my heart holding His idol which I carry in my handbag all the time. It took nearly 4 hours for them to call our name and I was chanting Baba’s gayatri manthra all this while. The doctor checked my B.P and said it all looks normal and even the blood report shows that there's no sign of heart attack. I sighed a big relief and thanked Baba koti koti times. They said all this was because of severe heartburn and prescribed some medicines for that and also advised us that we could travel next day without any problem. As I was feeling very weak we postponed our trip after two weeks. We could postpone our trip without losing too much money with minimal costs. Now tell me friends, who can do such miracles in life except our God of Gods Shri Sai Baba. Baba whatever You put us through good or bad we don't mind as long as You are there walking besides us holding our hands because we always know that there's a light at the end of every dark tunnel. And when You are there holding our hands showing light in that darkness there is no need to worry at all. Thank You so much Baba. Be with and bless us like this forever Baba. Please bless Your son, mom and dad with good health and sleep Deva. Sarve Jana Sukino Bhavanthu!! Sakalam Sarvam Sri Sainatha Arpanamathu! 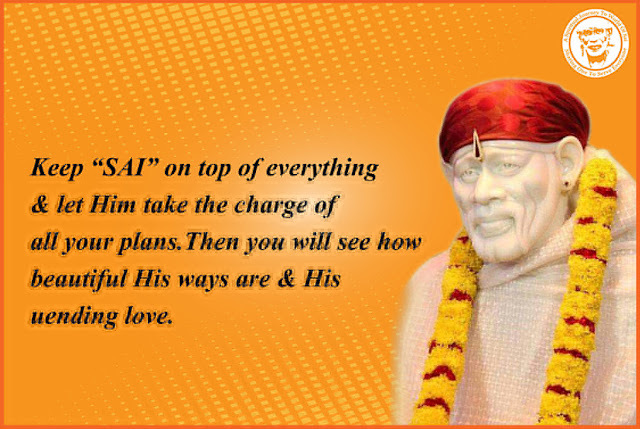 Anonymous Sai Devotee from Canada says: Hello, jai Sairam to all Sai devotees. I am Sai devotee from 2013, when I was going through very rough phase of my life. Babaji came into my life through a miracle. I was searching for English classes in my city. I went to Sikh temple, where I saw pamphlet about a tutor who was a Sai devotee, I saw Baba's picture in her home, and I asked her about Babaji. Then, she told me about Baba, I felt myself pulled towards Babaji. After that my life is going through ups and downs, but I always felt Baba's presence everywhere. Here, I want to share my experience. I was doing my refresher program in nursing here in Canada. In my final semester, I was posted into clinicals, where I need to show my skills in front of instructor. As you know, in health care, chances of errors are negligible, because of high risk of client's life. I used to be really scared because I am scared to perform in front of my instructor. I desperately wanted to pass this last and final semester as I spent so many years after coming here in Canada to become a nurse. Every day before start of clinical, I used to get so nervous, my heart would start palpating, and my memory seemed getting faded away. I went into flight mode, due to continue stress. One day, my instructor gave me warning, that if I would not perform as expected, I would be in trouble. Oh, what a panic state I was in on that day! I was continuously praying to Baba, please help me! I cried, cried for 3-4 days before my next clinicals, I was totally surrounded by negative thoughts, I was seeing my life slipping like sand from my hand. As I was sitting in front of Baba's idol, then, sudden thought come into my mind that lets take this last chance, not just thinking that it would lead to failure, but believing that it is a last chance to prove myself that I am competent, and believing that Baba gave me this chance because He knows that I deserve it. Here, comes those last 3 days of clinicals only time to save my career, my dream. I entered into clinicals with full faith and chanting Sai's name. I did all skills very organised, and did not show any rush in my skills, as I used to do, took my breaks on time. Till the end of the day, my instructor's attitude had changed as I got appreciation from my mentor staff. It was not more than miracles. Because during my whole clinicals, despite of doing very hard work, I was never appreciated by anyone, as compared to my other classmates, who did job by buttering the staff. Anyways, with Baba's grace my 3 days went well, and my teacher announced the result, I started crying, because I had passed. Oh Sai You are great! You are the love of my life. After these clinicals I went to doctor, where I got diagnosed with anxiety and panic disorder, and now under treatment, it also happened because He guided me and helped me to get the best treatment. 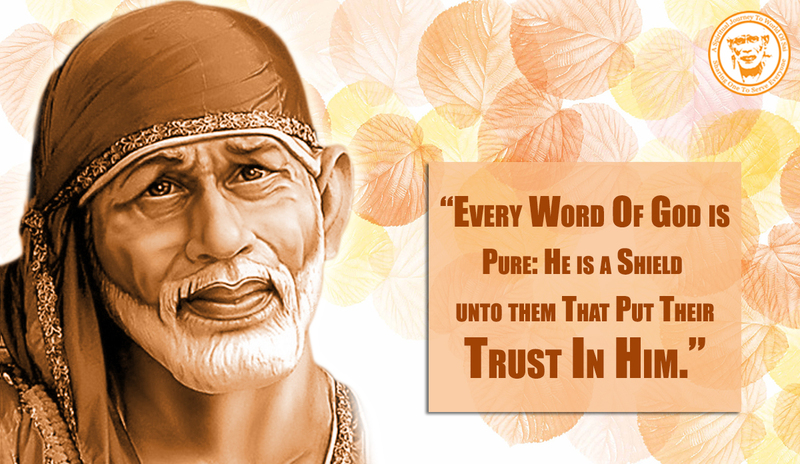 Sai, You know I am going through very tough phase, Sai it’s not easy to stay without my child. Oh Sai help me, guide me please. Need Your blessings Sai Baba. Sai Devotee N.R.Divya from India says: I am Divya from Bangalore and this is my second post on this blog. Reading all the devotee's experiences from this blog gives so much peace and relaxation to my mind. It always reminds me of Baba whatever the situation happy or sad be and encourages me to have steady and strong faith in Him. First of all thanks to the administrators of the blog for such a service being rendered by them and I pray Baba to help me complete this post without any obstacles or mistakes. I surrender this post under His lotus feet. Now coming to my miracle, for the past one week my daughter was suffering from fever and cold , fever was ok in two days but then came the actual problem. She developed throat infection and was crying continuously because of the irritation which made things even worse. She started getting droplets of blood along with mucus when she sneezed. I took her to a doctor and she said nothing to worry and said it was only because of the throat infection and gave syrup. But even after that I was not ok, because she had no food intake for 2days not even water. She always wanted to doze off. Seeing an active playful and cheerful kid in that situation was too bad and painful. I was so much worried, thinking what if she gets dehydrated and gets admitted in hospital. That was a terrible nightmare for me which I had experienced earlier and felt never should it happen again. Mothers can manage sufferings to some extent but when they see their kids suffer, it pains so much for them, which I am not able to express through words. So On Thursday evening I prayed from the bottom of my heart to Sai Baba, to cure my daughter's ill health and make her cheerful and active again and then make her have little, little food and water from tomorrow at least . I also told Him that I would post my experience if that happens. To my surprise and happiness from Friday morning my daughter started playing energetically like before and also started taking little, little food which would have not been possible without our Baba's blessings and Udi. Though, she is yet to recover fully, I have full faith in Baba that she will recover and become normal soon by Baba's blessings. Thank You so much Baba for having helped me to complete this post without any disturbance. 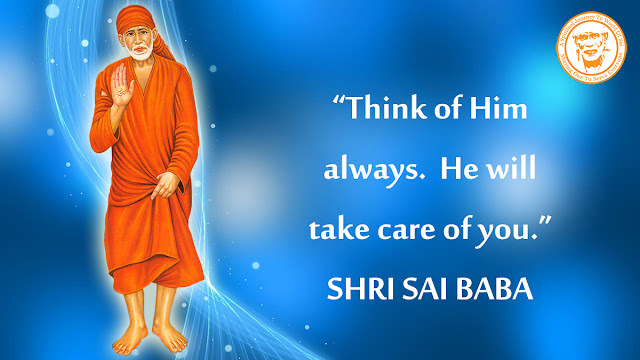 Always be with us and shower Your wonderful blessings on us Baba. We all love You very much! Shri Sainath Maharaj ki Jai! Anonymous Sai Devotee from USA says: I am a Shirdi disciple. I would like to share one experience with all of you or I shall say Shirdi Baba's miracle. Sometime in the month of June 2014, I read somewhere that lighting a lamp in the temple during the October month especially on Thursday is auspicious for my birth star. Those days I used to go every Thursday to Shirdi temple near my house. The temple also has Sai Baba’s statue as well as navagraha. I patiently waited for the October month to light the lamp in the temple. Finally the day came but I forgot to take the lamp with me. At the temple, the organizer refused to let me light the lamp stating devotees are not allowed to do so. Every Thursday at the temple Shirdi arathi CD is played. That particular day, in the middle of the song the electricity went off. We somehow managed to sing the song without the CD. The organizer appeared nervous as the temple didn't have any light. I offered to buy candles from the nearest store. When I returned back with the candles, the electricity had return. I handed over the candles/lanterns to the organizer. Finally, the organizer took pity on me and gave me permission to light the lamp. Anonymous Sai Devotee from USA says: I am a small devotee of Baba. Recently, I was feeling very down due to some reason. I prayed to Baba that You have to come and hug me as I am feeling low. After making that wish, I was curious, how will Baba come and hug me? I am a married woman with two kids. But then, Baba's ways are unique. Soon afterwards, I had a dream. I was near a temple and there was a poor, thin woman with her broom. For some reason, I took her broom and she got angry with me. She came to quarrel with me and for some reason, I hugged her. Her hair looked dirty, but I didn't mind. I felt great happiness in hugging her. She then looked happy too and hugged me back. When I woke up, I felt what a weird dream I had. Then later, I remembered that I had wished that Sai Baba should come and hug me. He came in my dream and hugged me in the form of that poor woman. Needless to say, I had come out of my depressed state of mind and was feeling much better after the 'hug' from my dear Baba. Dear admin, I am a very small Sai devotee but Baba is too great to be by my side🙏 in all tough times. I m working with an MNC since last 7 years and was ok with my profile till Oct 2015. I was transferred to a deptt which was not related to my profile and had no support. Somehow I was trying to manage but was very disturbed. I would pray to Baba to plz do smthg as I was unable to quit the job also due to financial issues. By the grace of Baba,in April 17, I got transferred again to another deptt with a good profile. Now it was my turn to prove myself as my boss said that he had full confidence in me that I will justify my profile which was again different. In July I was given an assignment in another city and I was sent alone to get it started, now this was again smthg new for me as I had not been anywhere outside for any assignments. However,I had another colleague joining me the next day. I kept on praying to Baba for his support so that I did not let down my bosse's confidence in me. We had our MD visiting us for this event from China. I was very scared but did not loose faith in Baba. It was an event for 3 days.which had lot of people cmg. By the grace and blessings of our Dear Sai, everything went well and to add more sweetness, our team was also awarded for best organised stall. O Deva, we cannot fathom the myriad ways You pull the strings of these universe, so we surrender to Your feet and bless You to guide us.